After Neon Light‘s small guessing game they played on Monday, the festival’s fully fledged line-up is out now! Neon Lights has revealed 17 more names its 2016 lineup. Billed as the region’s ‘music lovers’ festival, Neon Lights will be happening over the weekend of 26-27 November, 2016. The announcement comes months after Neon Lights shared its second run in Singapore with two loved acts Sigur Ros and Foals headlining the two-day festival, across six stages. Amongst acts joining this year’s lineup include Canadian indie-electro duo Crystal Castles, Swedish alt-folk hero Jose Gonzalez and the original Godfather of Funk himself, Detroit’s George Clinton who will be bringing his 25 piece mothership for a classic show featuring the best of Parliament and Funkadelic’s songs that had such an influence on Prince amongst other acts. 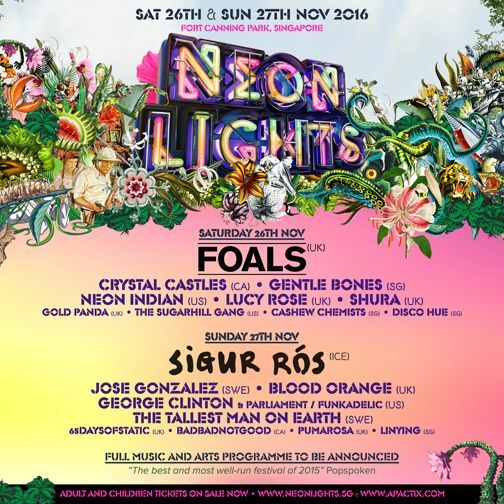 Notably, Neon Lights 2016 will host the first-ever performances in Singapore of new stars such as England’s Shura and Blood Orange (aka Dev Hynes, who has produced for Florence & the Machine amongst others, plus Swedish songwriter The Tallest Man on Earth, New York hip hop pioneers The Sugarhill Gang. New acoustic superstar Gentle Bones will head up the Singaporean contingent at Neon Lights, fresh from two sellout shows at Esplanade Theatre last month. The beautiful atmospherics of Linying and the electronic dance rock quartets Cashew Chemists and Disco Hue will be strutting their stuff to their home crowd at the Fort Canning Park, as part of the Neon Lights 2016 lineup. Last year’s inaugural festival drew over 10,000 people over two days, with music fans travelling from all over to experience over 50 musical and art performances including headliners, Damien Rice and CHIC featuring front-man Nile Rodgers. A limited number of early bird ticket remain available, starting at SG$120 for a single day pass from www.neonlights.sg. Oh well, there won’t be LCD Soundsystem, but at least we’ll have the funk master George Clinton to entertain us (In no relation with the democratic presidential candidate).